The Deluxe roller banner is supplied with a high quality printed graphic, but unlike the standard roller banners has a flat professional looking cassette. Supplied with a padded protective carrying case to accommodate. 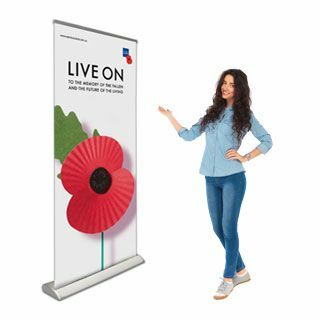 Supported with a flat extra stable base, the Deluxe Roller Banner has a telescopic pole, meaning you can adjust the height to your need (1600mm high) or even higher (2150mm) making for a more versatile display system. Perfect for high end exhibitions and events, or long term re-usability. 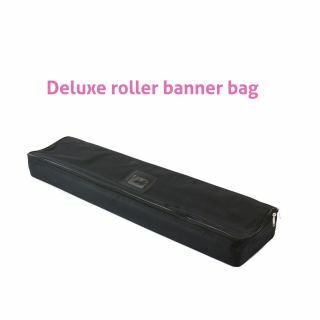 We will supply your Deluxe Roller Banner at 2000mm high as standard, unless you let us know otherwise. Roller banners are ideal as a compact transportable graphic, which is great for a range of uses from Shopping centres, hotels, car showrooms to airports and trade shows. We print our graphics on third generation HP Latex printers, depending on your quantity this may be on the new LX1500, or the LX570, both are extremely high quality and are leading printers from HP, they are just different sizes. Your roller banner will be printed to a 440gsm grey backed roller banner material as standard. This material will block any light from behind your graphic and perform well under the spotlight – stopping your image from appearing washed out in bright lighting. We do offer other material options for your roller banner, at an additional charge, please get in touch with us if you need something slightly different. Looking for a pull up banner? A pull up banner is the same as a Roller Banner, it's just a different name for the same thing. What is the difference between the standard roller banner and deluxe roller banner? 1) Standard Roller Banners are provided with a base on two twisted feet and is printed on a greyback PVC material with no lamination. It comes with a lightly padded carrying case. 2) Deluxe Roller Banners are, like the standard roller banner printed on greyback PVC but are provided with a deluxe, flat extra stable base, and a higher quality carrying case. It also comes with a telescopic pole, meaning you can have a short (1600mm high) or super high (2150mm) banner depending on your requirements. The above choices provide high quality product that is perfect for majority of exhibition display applications. 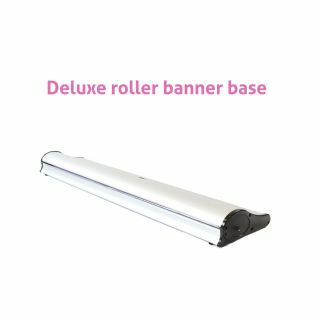 Can I order a replacement graphic for my roller banner? Yes, if you need to update the artwork in your roller banner, just let us know the size and model of your existing cassette, and we can print and send out a new graphic for you to insert into your roller banner. If you're not too comfortable trying to do this yourself, you can always send your cassette over to us, and we can print and insert your new graphics for you too. If I am ordering a roller banner and a pop-up system for one exhibit, will the colours be the same? Colours will always differ slightly across different material, printers, final application, but if your looking to match as closely as possible to a pop up system we have or are providing for you, make sure you tell us, we will need to upgrade your graphic material to get the closest possible match.